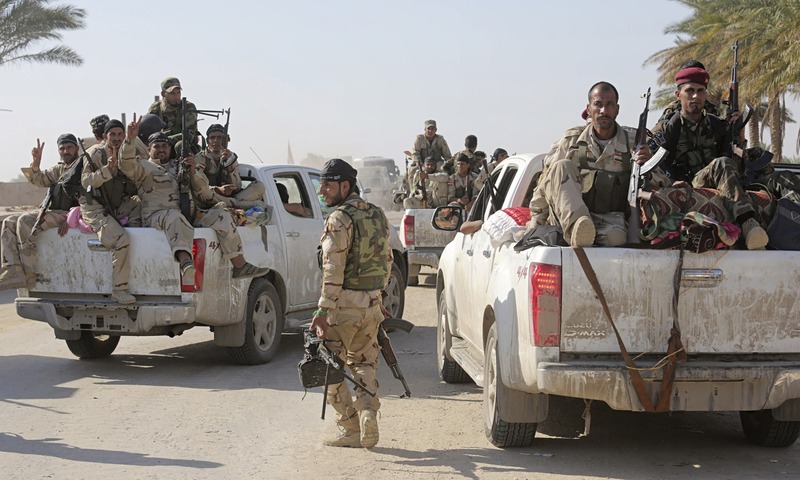 JNN 23 Nov 2014 BAGHDAD, — Iraqi security forces attacked two towns held by the Islamic State (IS) militant group in Iraq’s eastern province of Diyala on Sunday, a provincial police official said. Security forces backed by Shiite militias and aircraft, tried to enter the Terrorist-seized town of Saadiyah, some 120 km northeast of the Iraqi capital Baghdad, from three directions and gained a foothold in several district on the edges of the town after heavy clashes with IS Terrorists, provincial police chief Lieutenant General Jamil al-Shimary told Media . Earlier in the morning, the troops recaptured six villages in the rural area east of the Saadiyah, killing at least 10 Terrorists and destroying three of their vehicles, al-Shimary said. Meanwhile, a suicide bomber blew up an explosive-laden car in a crowd of security forces and Shiite militiamen near Saadiyah, killing two security members and two militiamen, while six security members and four militiamen were wounded, a provincial security source told Xinhua on condition of anonymity. Three days ago, security forces carried out an offensive to free the town of the Wahabi Terrorists and managed to seize the town after they entered it from two directions. The troops, however, apparently withdrew from Saadiyah late on Thursday by fierce clashes with IS militants and blasts of roadside bombs and booby-trapped buildings. Also in the province, Kurdish security forces, known as Peshmerga, carried out a major attack in the early morning hours on the militants-seized town of Jalawlaa, about 130 km northeast of Baghdad. The Kurdish fighters managed to establish footholds in three districts, while fierce battles continued with the IS militants from house to house, a provincial security source told Xinhua without giving further details about casualties. The Peshmerga forces also cleared an army base near Jalawlaa, which was seized earlier by IS group, after clashes with the Wahabi Terrorists. The base was previously known as Camp Cobra, which was used by U.S. forces as Forward Operating Base. At least seven IS Terrorists were killed in the base, including a would-be suicide bomber, and three vehicles were destroyed, including a booby-trapped one, the source said. This entry was posted in Middle East and tagged Iraqi Forces, Iraqi security forces, IS Held Towns, provincial police, security forces, Shia Militia, Wahabi Terrorists. Bookmark the permalink.